Siegfried Fischbacher and Roy Horn performed their final charity performance alongside the giant tiger that had once attacked Horn. They are pictured here nursing a 4 1/2-month old tiger cub in Las Vegas in Aug. 2008. LAS VEGAS — Illusionists Siegfried and Roy — and the Bengal tiger that ended their careers — shared the stage again Saturday night for a haunting final performance. The brief charity show saw Roy Horn and Siegfried Fischbacher side by side with Montecore, the massive white tiger that brutally mauled Horn during a 2003 performance. Horn re-emerged Saturday dressed in black robes, his face covered with a skeletal mask. The dark stage was covered in smoke. Horn limped slowly onstage, often steadying himself on Fischbacher's shoulder. The two slowly performed a signature illusion as Fischbacher, dressed in white robes and a mask, stood inside a cage, which was then cloaked in drapes. As Horn removed the curtain seconds later, Fischbacher appeared across stage, a hulking tiger in his place. As the crowd took to its feet, the men removed their masks. Fischbacher standing between the tiger and Horn. They waved and blew kisses at the audience, but said nothing. An announcer left the crowd with this final thought: "Within all of us there is an illusive melody, which when heard and followed will lead you to the fulfillment of your fondest dreams." The performers' manager, Bernie Yuman, later confirmed the tiger was Montecore. In October 2003, the tiger sank its teeth into Horn's neck, dragging him offstage in front of a horrified audience. The illusionist, now 64, was partially paralyzed, suffering a damaged neck artery and crushed windpipe. After 13 years and more than 5,000 performance, "Siegfried & Roy" show at The Mirage immediately went dark, ending one of the most successful shows in Las Vegas history. The Saturday performance at the Bellagio hotel-casino was the highlight of a lavish benefit for the Cleveland Clinic Lou Ruvo Center for Brain Health. The center, which will treat brain disorders like those Horn now suffers, is set to open later this year in a building designed by architect Frank Gehry. 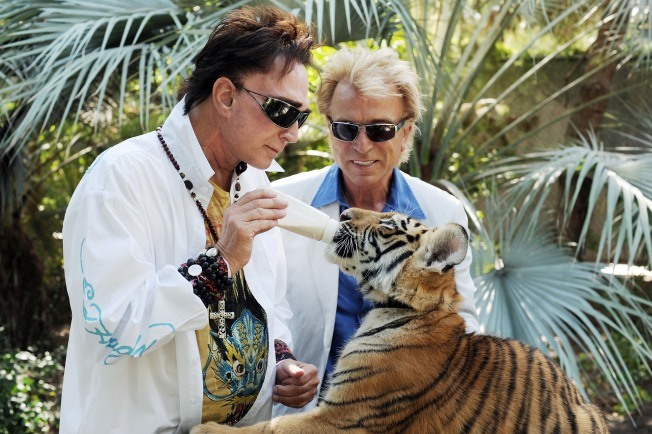 Siegfried and Roy's performance will air Friday in a one-hour special on ABC's "20/20." During Horn's long rehabilitation, both men remained devoted to their exotic habitat on the Las Vegas Strip. The Secret Garden and Dolphin Habitat at The Mirage hotel-casino houses lions, tigers and leopards. Fischbacher, 69, has called it Horn's "reason to get up in the morning." The pair have said they believe Montecore sensed Horn was having a mini-stroke and was dragging him to safety, rather than attacking him. Animal experts have disputed that theory. The U.S. Department of Agriculture did find that the "Siegfried & Roy" show failed to protect the audience because it had no barrier separating the exotic animals from the crowd. The illusionists' production company, S&R Productions, received a letter of noncompliance but was not fined.